Many common illnesses and accidents can be treated at home and do not require the attention of a doctor. We hope you find the following notes of some guidance in self- management. Pharmacists are a highly qualified source of advice on many common illnesses and can be contacted at your local pharmacy. Immediately remove the source of burning and apply cold water to the affected area. If the burn blisters or the burn is extensive or the mouth or nose is affected, you should attend the nearest accident and emergency department. The vast majority of such illnesses are caused by viruses. The illnesses are self-limiting, that is to say they settle on their own, often with little or no treatment, after a course of time. Antibiotics do not kill viruses. However, the following supportive measures can ease the passage of a viral illness and assist recovery. Viral coughs and colds are often accompanied by symptoms of sore throats, sore ears, headache and feeling hot and cold with fever. It is important for all ages to drink plenty of fluids. Steam inhalation can help relieve stuffiness and congestion of the upper airway and will often soothe a dry irritating cough. In adults, gargling with a mixture of soluble aspirin in water can relieve symptoms of soreness of the throat. The headache and fever are both helped by taking regular paracetamol. This is particularly important in children, who are very sensitive to rises in body temperature, where the administration of paracetamol syrup (Calpol or Disprol) in the correct dosage for age can be supplemented by stripping the child, bathing in tepid water and ensuring adequate ventilation. Use a fan where possible. Specific symptoms such as chest pains, wheezing or coughing up offensive or blood stained sputum are of concern and should prompt you to seek medical advice. Diarrhoea and sickness is often caused by a viral infection and will be self-limiting. It can, however, be caused by contaminated food, particularly relevant if you have recently travelled abroad. After vomiting it is important to let the stomach rest by not eating or drinking for two hours afterwards. Thereafter sips of clear fluids such as water or squash can be taken. After 24 hours of clear fluids a light diet can be introduced. With return of eating, diarrhoea may well worsen. In adults, taking appropriate tablets or capsules, available from your pharmacist, may relieve diarrhoea. Persistent and recurrent vomiting, unresponsive to these simple measures, particularly when associated with diarrhoea, may give rise to fluid loss with possibility of dehydration. If sickness continues for more than 24 hours and/or diarrhoea does not settle within 72 hours, contact the surgery for further advice. Direct application of pressure and elevation of the affected limb as appropriate can stop any bleeding. 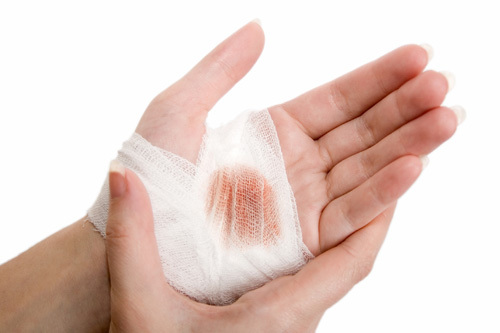 A deep cut may require stitching and advice from the accident and emergency department. Grazes should be cleaned under running water. A clean dressing may then be applied. On the first day a rash appears as small red patches about 3 – 4mm across. Within a few hours, small blisters appear in the centre of these patches. During the next 3 – 4 days further patches will appear and the earlier ones will turn ‘crusty’ and fall off. Calamine Lotion may be applied to soothe the often severe itching. Cool baths may help. The most infectious period is 2 – 3 days before the rash appears and up to 5 days after this date. Children may return to school/nursery when the last ‘crusts’ have fallen off. The rash appears during the first day and usually covers the body, arms and legs in small pink patches about 2 – 4mm across and doesn’t itch. No other symptoms are usually present apart from occasional aching joints. It is infectious from two days before the rash appears, until the rash disappears in about 4-5 days from that date. The only danger is to unborn babies and it is important therefore that any contact is informed, to enable anyone pregnant to contact their surgery for advice. Immunisation can prevent this disease. The onset of rash is normally preceded by a cold-like illness with runny nose and fever. A rash appears around the fourth day of illness and is red, blotchy and appears on the face and body. It is infectious 2-3 days before the rash appears and up to 10 days after that date. Immunisation can prevent this disease. Swelling of the glands in front of one or both ears. It is infectious from 2-3 days before the swelling appears and up to 10 days after that date. Immunisation can prevent this disease. A child will develop a fever because of an infection. Usually the child will get over the infection without the need for antibiotics. Most childhood infections are caused by viruses and these do not respond to antibiotics. The following advice will help bring your child’s temperature down and make them feel better. 1. Always keep a supply of paracetamol and/or ibruprofen syrup (Calpol, Disprol, Nurofen) at home. a) Give the maximum dose of paracetamol and/or ibruprofen syrup stated for the age of the child. Repeat every four hours as necessary up to the maximum daily dose stated. b) Dress your child in cool clothes. A lot of heat is lost through a child’s head so keep uncovered. Cool the room by opening windows and doors. c) Give your child plenty of cool drinks as fluid is lost with a fever. If the child is reluctant to drink, encourage small amounts from a favourite cup. d) Use tepid water to sponge your child. Tepid water is more effective than cold water. e) A child with a fever is likely to be restless at night. If your child is awake, offer cool drinks and sponge him/her down. f) If your child does not improve after following the above measures call NHS 111 or your local doctor. 3. Very rarely, a child under 5 years will have a convulsion with a high temperature. The child will shake all over and become very still. It usually subsides in less than five minutes. Lie the child on their side and stay with him/her while it lasts. If there is another adult in the house, ask them to phone a doctor. If not, call when the convulsion has passed. 4. If your child has a rash as well as a temperature, contact your doctor or NHS 111. Hay fever is caused by an allergy to pollen. Common hay fever symptoms are runny, itchy and/or blocked nose, sneezing and itchy eyes. Common treatments are an antihistamine nasal spray or medicine, and/or a steroid nasal spray. Other treatments are sometimes used if these common treatments do not work so well. You can always pop into your local chemist to speak to the Pharmacist for advice.